After two deaths, the city made life-saving changes on two key crosstown streets. The westbound lane, on 29th Street, begins in earnest at Second Avenue. And I had a nice run until entering Midtown, when I encountered the full miseries of urban life. For now, the 29th Street lane doesn’t extend past Broadway, near the location where cyclist Michael Mamoukakis was fatally struck by a bus driver in 2017. 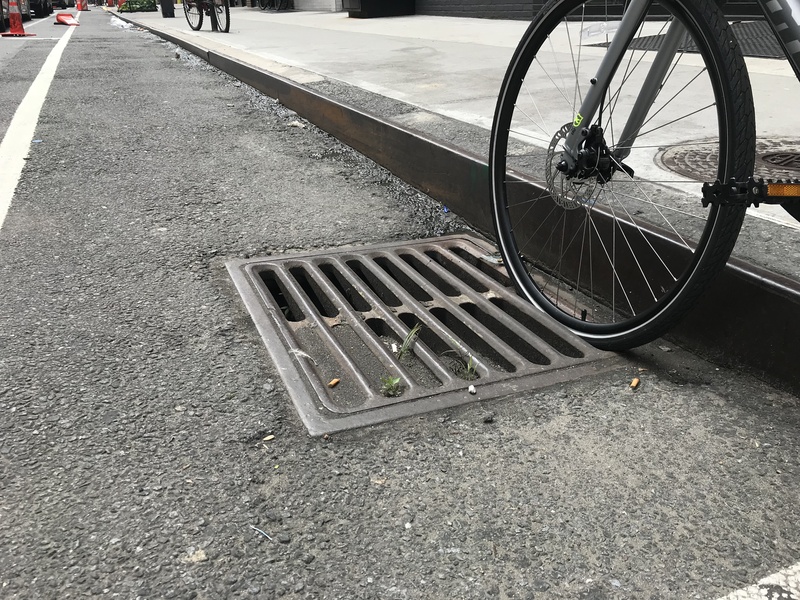 As a result, cyclists are forced into the roadway (though paint is coming soon, based on the partial milling seen below). For the record, the police officer above did not give the white Jeep a double-parking ticket. 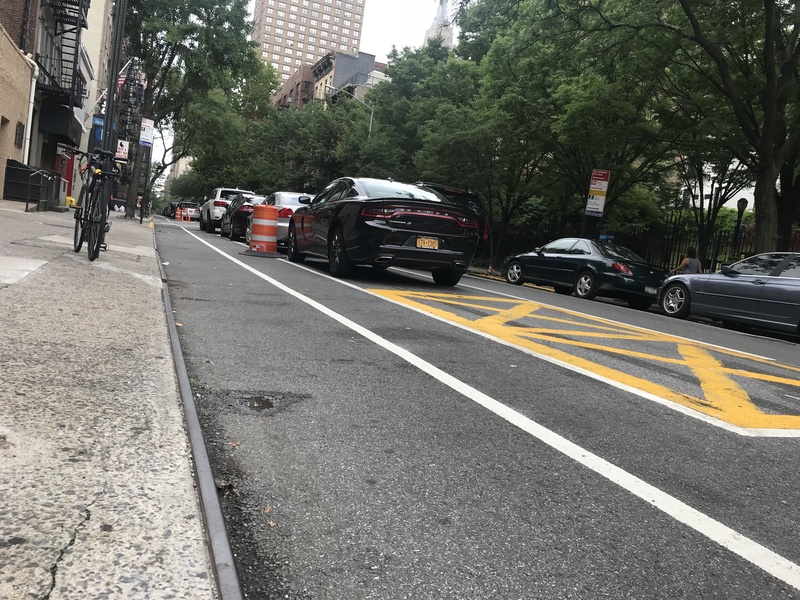 Conditions are far better on the eastbound 26th Street path, which features green lanes from 10th Avenue to Seventh Avenue — the stretch where cyclist Dan Hanegby was killed by a bus driver in 2017. The bottom line: The new lanes will be far safer for cyclists, who are now mostly protected from buses and cars (with caveats for those mixing zones and several blind entrances for off-street parking). The Department of Transportation said the lanes would be fully completed by August (weather permitting). 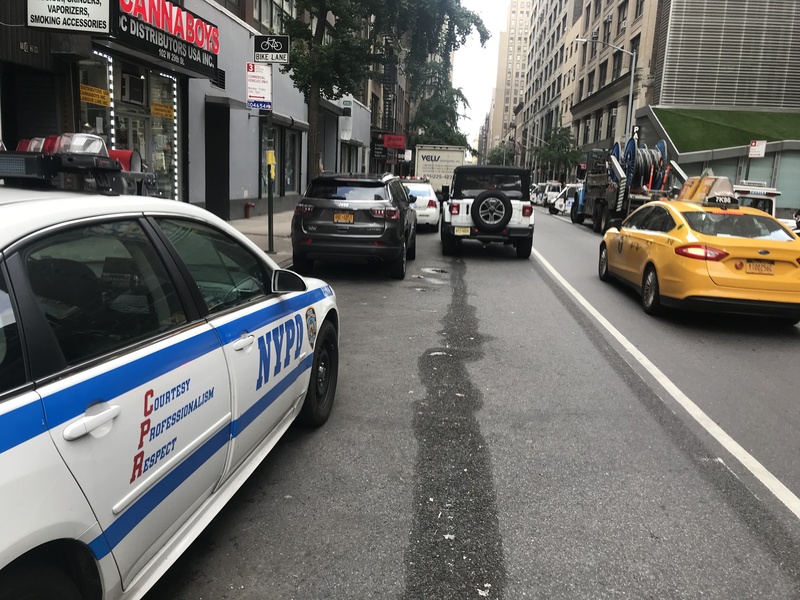 For drivers, the success of this roadway, like any roadway in New York City, will depend on enforcement of double-parking by the NYPD so that auto traffic flow is not cut off by the selfish. In other words: it will fail often, and drivers will likely blame the cyclists like they always do instead of blaming the real culprit — the other driver. On the plus side, I filed a complaint against this guy with TLC via the Reported app. So there’s that, at least. I think this misses the point. 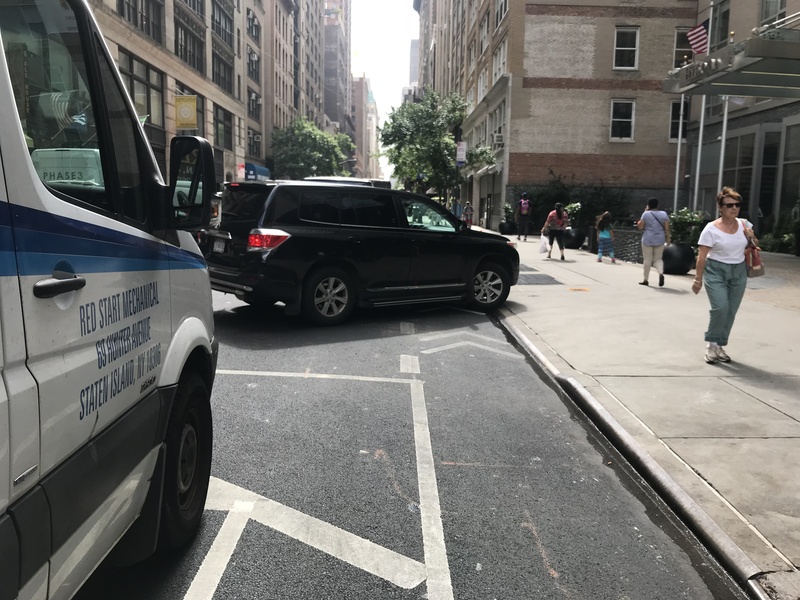 A combination of DOT & NYPD is in charge of regulating curb space, and rampant double parking is an indication that they are failing at that activity. Enforcement works when it’s swift, severe, and certain. We’ve made it super cheap to park in NYC, which makes it highly desirable to park there, leaving literally no legal space for deliveries. So truck drivers double park and break the law en masse. Cops then either can’t enforce on such a large scale or won’t enforce laws on people with few options. Since trucks drivers don’t get tickets, a lot of other folks can get away with double parking, and the entire system falls apart. It all starts with cheap curb parking, and DOT is not addressing this well when they implement these projects. Just look at the disaster on Dyckman street. A step in the right direction, but the bike lane is way too narrow because we still feel the need to provide so much cheap or free parking on every single street. Is it too much to ask for DOT to give people on bikes at least two crosstown routes in a wide, protected bike lane that can’t be parked in? There needs to be major parking reform to get these cars off of our streets. 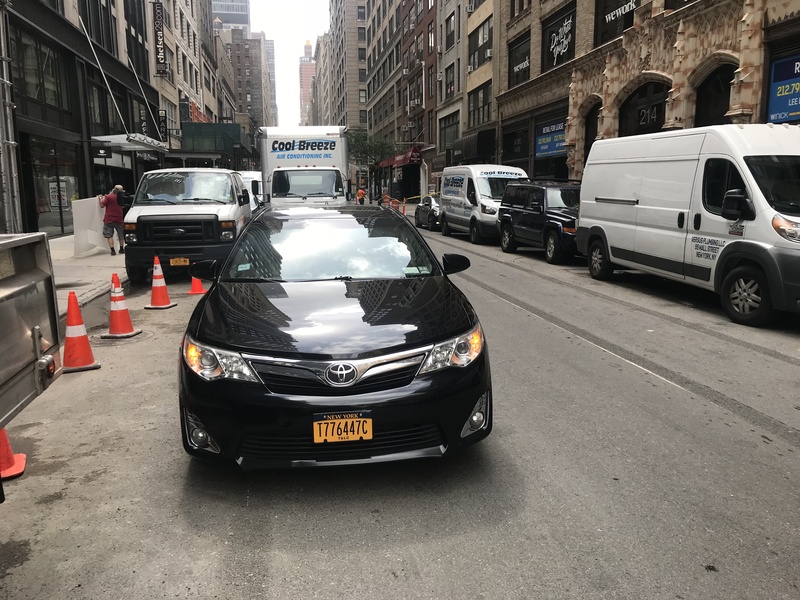 Double parking by commercial vehicles is a result of free and/or underpriced curbside space combined with parking placard abuse by government workers. The double-parked commercial vehicles must do business and have no option to park legally since the curbside spots that should be for them are not available. Ticketing them more is not the solution. The solution is to price curbside space higher, and to ticket the non-commercial vehicles who park illegally with impunity due to fake and real placard abuse. Clearly the real solution is to create loading zones by getting rid of parking spaces. A related note: when trucks are making deliveries on a street with a bike lane, they usually stop in the bike lane itself. But this morning on Woodward Avenue in Queens, I was pleased to see that a truck that was making deliveries to a bodega was parked outside the bike lane. Whenever we see a truck parked appropriately like that, we should stop and give the driver a word of thanks. At the same time, the two-way bike lane on Clinton Street near the Williamsburg Bridge has been removed between Grand Street and East Broadway, having been paved over following street work, and the northern portion between Delancey and Broom Streets is often rendered unsuable by the influx of pedestrians who ignore the two huge orange signs that say “DON’T WALK IN THE BIKE LANE”. One might suppose that the Clinton Street lane will be re-painted eventually. 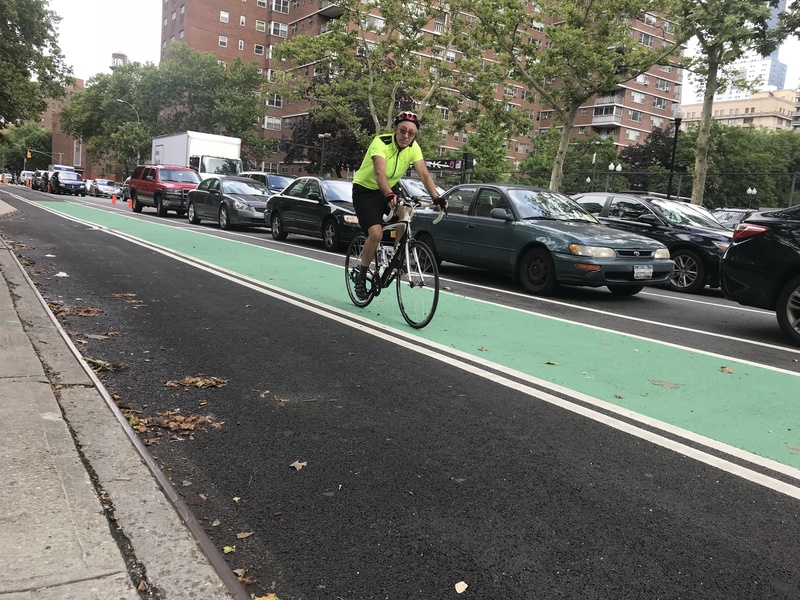 But much of the bike lane on Woodward Avenue in Queens has been erased by street work and piecemeal repaving; and there has been no re-painting there for months. And that’s in Reynoso’s district! 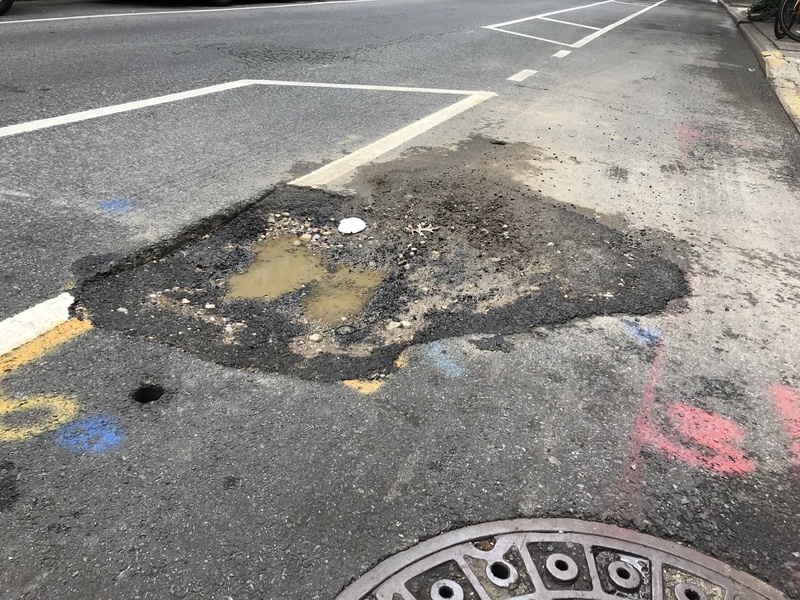 So I don’t like the chances of Clinton Street getting fixed any time soon. So win some, lose some. It’s very frustrating when a street is re-paved and there is a long wait before the thermoplast delineating a curbside bike lane is striped. It creates a dangerous condition and is major hardship for cyclists. The re-striping should be days after re-paving, not weeks, and certainly not months after!! Right. 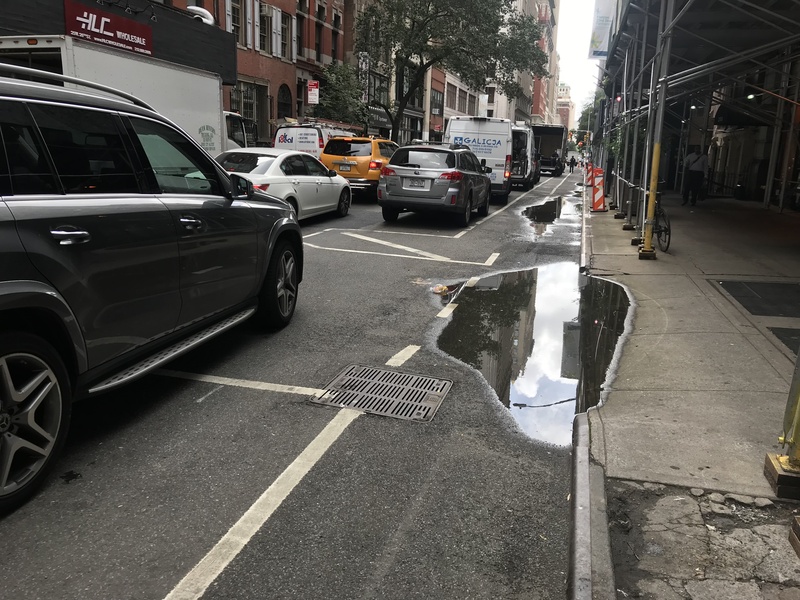 And it is particularly bad on Clinton Street south of Grand Street because that street used to have a two-way bike lane on the eastern side. But, without the bike lane present, cyclists riding north on Clinton have to cross over to the western (northbound) side at East Broadway, where Clinton becomes two-way for cars, and then must cross back over at Grand Street to the rest of the two-way lane on the eastern edge of the street. 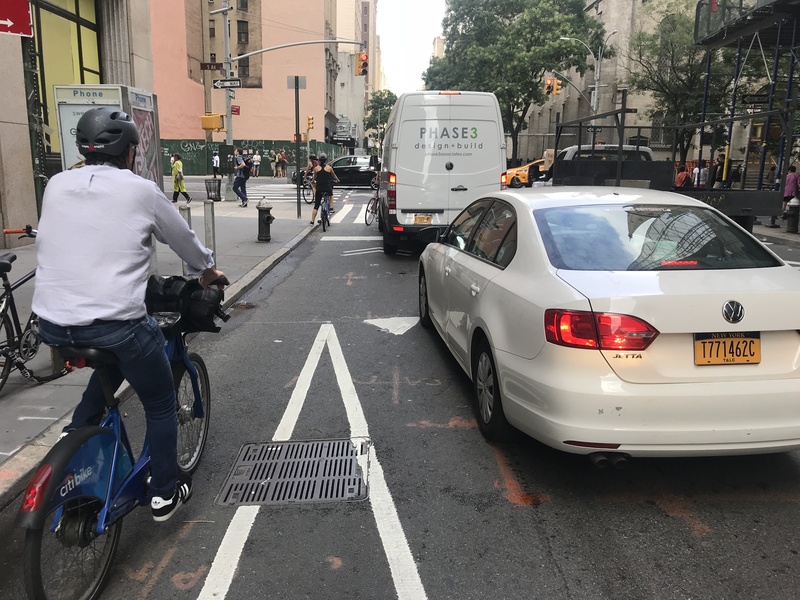 But some northbound cyclists stay on Clinton Street’s eastern side between East Broadway and Grand, riding where the two-way lane used to be; and this creates the dangers associated with wrong-way cycling. There is no good answer there. Until the re-painting occurs (if it ever does), the street will be a hazard. True, but as you say it’s become so routine to break the law, that it’s expected. This is not how cities should be operated. I have used both streets for my crosstown (2nd to Hudson River) bike commute for the past 15 years. Needless to say I was excited to learn about the creation of bike lanes on both streets. It is in short, a disaster by design. We will likely see more injured cyclists, more injured pedestrians and more hostile drivers as a result. Mixing zones aren’t so bad as long as one is patient and doesn’t try to force themself ahead of cars. Wait your turn. 5th avenue is a very busy pedestrian crossing generally cars have to take that turn slowly anyways. In my mind that’s what mixing zone implies–everyone gets in line and waits their turn. As a bicyclist I get frustrated every time I see another bicyclist try to cut off a right-turning car that is ahead of them. A behavior that is neither safe nor considerate of others.